Hyde & Sleep offer two different types of mattress in an attempt to have the perfect mattress available for everyone. They have a memory foam mattress and a hybrid mattress, so whichever you prefer, there’s a Hyde & Sleep mattress to suit your needs. The memory foam mattress is a 5.5 out of ten on the firmness scale, so basically, it’s right in the middle. The hybrid mattress is a 6 on the firmness scale, so still in the middle, but just slightly firmer than the memory foam offering. The hybrid mattress is more bouncy and has greater edge support. It’s all about personal preference, however, if price is an issue, it’s worth bearing in mind that the hybrid mattresses are significantly more expensive than the memory foam ones. What are people saying about the Hyde & Sleep mattresses? What do we think about the Hyde & Sleep mattresses? The Hyde & Sleep memory foam mattress is a standard 25 cm depth so it should suit all bed frames. It’s made up of three layers of foam, each one offering a different function. The base layer is 17.8 cm of support foam. This clever layer consists of seven zones, specially designed to offer extra support just where your body needs it. On top of this base layer you have a supporting middle layer consisting of 1.9 cm of transition foam. The top layer is 3.8 cm of memory foam which helps with comfort and also cooling. It contours nicely to your body for a cosy night’s sleep. The cover is 98% polyester and 2% elastane making it stretchy so it’s easy to get on and off when you want to wash it. It’s a thin cover which helps with airflow within the mattress. It’s a simple design but it’s of a high quality. The Hyde & Sleep hybrid mattress is also made up of three layers, but this one has a layer of microcoils in the middle. Like the memory foam mattress, this one is also a standard 25 cm deep so should fit fine in any bed base. The base layer is the same as that of the memory foam mattress. It’s a 17.6 cm layer of zoned support foam, acting as a base for the upper layers. The middle layer is where things get different with the hybrid mattress. Here you get 1.9 cm of small coils which give you bounce and help to relieve pressure. The microcoil layer is edged with foam for added support where you need it. 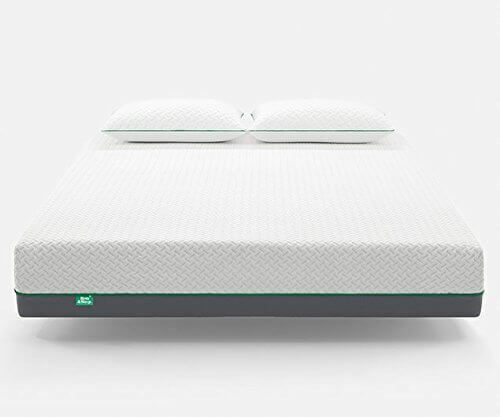 The top layer is 3.8 cm of memory foam, just like you get with their memory foam mattress, offering both extra comfort and cooling. 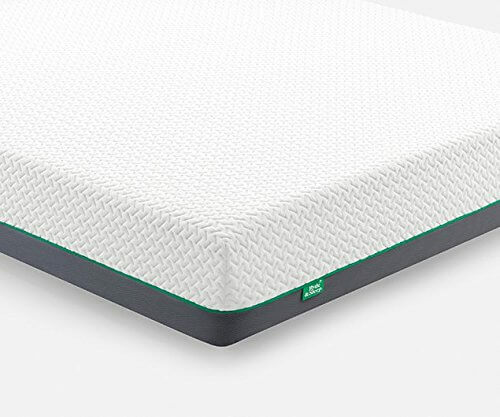 The covers of both mattresses are exactly the same, so you’re getting a stretchy 98% polyester and 2% elastane washable cover on this mattress too. There is quite a difference in price between the two types of Hyde & Sleep mattress. 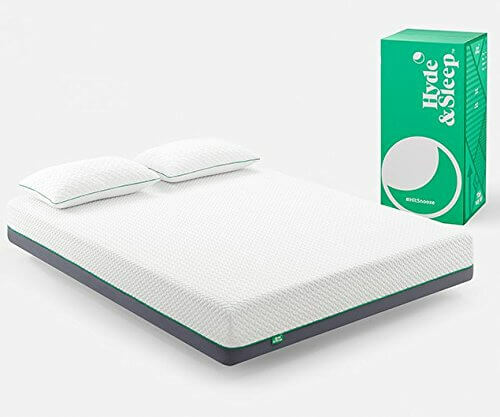 If you’re looking for a bargain priced mattress then do check out the Hyde & Sleep memory foam mattress as it’s a great deal. Prices start at £299 for the single, £399 for the double then up to £599 for the most expensive size, the Super King. The hybrid mattress is a little more pricey, but still not outrageously expensive, with the single coming in at £499, the double at £599, up to the Super King at £799. This is one point where you’re slightly let down by the Hyde & Sleep range. There are only four sizes to choose from, so if you have a small double bed, or an EU size bed, you’ll be out of luck. The choices are single, double, king and super king. So, you’re interested in a Hyde & Sleep mattress, but what about the level of service you’ll receive if you place an order? Well, you’ll get free shipping on all Hyde & Sleep mattresses, regardless of which model you order. The mattress arrives compressed, and packaged up in a box for ease of moving into the bedroom. Delivery is within 2-5 business days, so if you order just before the weekend, you could have a slight wait for your mattress. However, you do get a 100 night trial period, within which you can return your mattress for a full refund if it doesn’t suit you. There’s also a generous 10 year warranty on both types of mattress. Being a relatively newly released mattress, there are not many reviews out there of either type of Hyde & Sleep mattress. Unfortunately, the few reviews that are out there seem to be rather negative with regards to customer service. Hopefully these are just teething problems with the business but only time will tell, it may be worth waiting a while to see if this improves before placing your order. These issues aside, we like the fact that Hyde & Sleep offer two types of mattress, so there’s one to suit all preferences. It should be noted that the Hyde & Sleep mattress is recommended for people weighing under 19 stone, so for anyone heavier than this, a different mattress is probably preferable. While most standard sizes are offered, it would be nice to see at least a small double available. We particularly liked the quality of the cover, and the fact it stretches as putting mattress covers back on when they’ve been washed can be pretty tricky at times!